If you're tired of trying to keep up that nice suburban look, think about getting back to nature with some natural landscaping. "It's a more responsible way to landscape here in the high desert," says Sandy Melchiori, of Response to Nature landscaping. "It's not purely using natives; it's using a mix of natives and non-natives that are hardy, drought-resistant. They can withstand our sandy, rocky soil better, so you don't have to do as much with soil amendment." Native plants stand up better to predations from rapacious neighborhood deer, require less maintenance and less water. Water conservation is both a goal and a benefit of natural landscaping. "Water is a concern around here," Melchiori says. "It's good to conserve as much as possible." If you still want some ground cover and a green belt, creeping red fescue is a low-water alternative to grass, and it helps keep the dust under control. Native flowers tend to have subtle colors, but you can plant them together to enhance the beauty. "I do a lot of that kind of combination," Melchiori says. "When you mass them together, it's beautiful." Native rock can also be used to create eye-pleasing elements in your landscape. Natural landscaping can be as orderly or as wild as you want. It can look "landscaped," or it can look wild and untrammeled. Or you can transition from landscaped areas to blend seamlessly with the surrounding sage. Sisters Country has a lot of microclimates, from the riparian zone along the Metolius River in Camp Sherman to the dryland juniper flats. 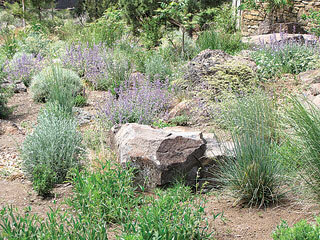 Melchiori notes that you can bring those elements together in your yard, planting alder, currant, redtwig dogwood, western spirea, and lupine to create that Metolius River feel, and textured dryland native perennials to mark your transition to sage and juniper. She also cites Brasada Ranch as an interesting use of materials and artifacts from the local neighborhood: "Using rock from the site or relocated from nearby farms that have been cleared of rock for agriculture purposes, and reclaimed materials such as old fencing, old palettes, and barn lumber as outdoor arbors, enclosures, planters, and fencing. These materials blend aesthetically with our natural landscape and make functional repurposed landscape features." So if you're looking for low maintenance, reduced water usage and compelling beauty, consider moving away from the suburban look and go natural.